"A solo drum record that manages the rather daunting feat of sounding unique. Recorded live in Athens in 2016, "Kopfkino" (head cinema?) is a short display of fascinating techniques and arresting rhythmic invention. The unnerving sounds that open the disc are the result of playing a cymbal with a mallet while manipulating a microphone on the same cymbal. It sounds computer-manipulated, but I don't think it is. Bass drum pumping adds a bit of undertow. There follows a section of "regular drumming" with rapid switching of sticks — mallet, stick and brush — in rapid tattoos and rim shots. The transition between the cymbal dance and this tighter/taughter playing is a study in patience and attention to detail. 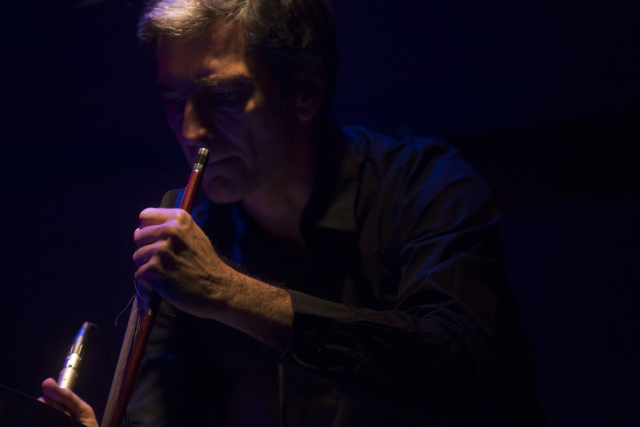 The microphone has become another percussive instrument and Dimitriadis employs it well, conjuring sand and flapping metal in equal measure. Tension is built and maintained by a near-constant fidgety rhythm, which rises and falls in volume and insistence. Insects and other natural sounds are mimicked admirably, and the command of timbre, especially on the snare drum, is impressive and ear-bending. This disc stands out from the pile of solo percussion offerings, and I'm definitely going to be looking into this man's playing more closely. (Check out his web site for a short video of his soloing)." Thessaloniki-born percussionist Yorgos Dimitriadis is one of the most prolific members of Berlin's Echtzeit network, where he has played with Frank Paul Schubert and Mike Majkowski (in the excellent Fabric Trio), Miles Perkin and Tom Arthurs (as Glue). Kopfkino (a German expression for "film in your head") is his first solo effort. Listening to it, you might be surprised this is a live recording with barely any electronics. Dimitriadis plays a very ordinary, small drum kit, in a conventional way, using sticks, mallets and brushes, but only with his right hand. In his left is a microphone which he uses to generate sounds reminiscent of large singing bowls - aural landscapes that rustle, fizzle and hiss. Dimitriadis alternates between introspective passages, in which his music displays wide spaces, and hectic video game sounds, where the music pants and moves forward in a jerky and twitchy manner. An unusual approach, he keeps his performance short and tense. Black Pus, BrianChippendale's drum project (but with the addition of electronics and voice) came to mind when I first listened to Kopfkino, In comparison, this album is more subtle and relaxed, less energetic. Some listeners might be skeptical when it comes to drum solos. This album could prove them wrong. 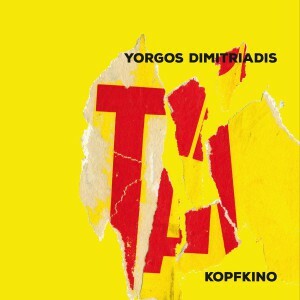 Kopfkino is available on CD.